What's your follow up like? 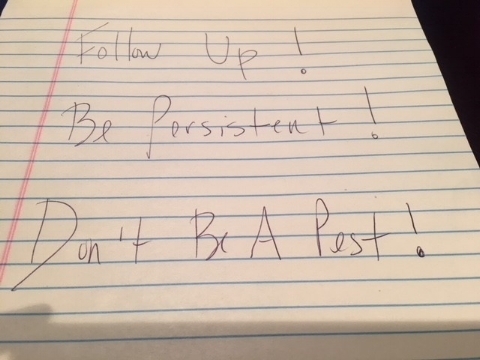 A reminder to myself to follow up, be persistent but don’t be a pest! Regardless of the type of business we’re in research shows that the most successful people are those that consistently follow up. We can’t get the sale if we don’t follow up. We can’t build a relationship if we don’t follow up. To be able to follow-up successfully is clearly a skill and a characteristic that screams that you are different. Whether you are an attentive waitress or advertising executive, it is all about the follow up. Let’s face it, most people just don’t consistently follow up. What’s your follow up like? When I truthfully answer this question, I know I have some work to do here. It’s not because I don’t follow up but because I am one of “those people” that will continually follow up. For an example, if there is a “did not respond” until I hear no I am going to try and connect with you in various ways. Some people appreciate the persistence and I think it makes them that more interested in finally connecting. But, in most cases, I have to admit that the level of tenacity I bring to follow up isn’t always balanced; and, sometimes the scale can tip and prospects might (probably) think I’m a pest. The premise of the study was based on the fact that persistence pays off; which, of course makes perfect sense - that is intellectually it makes sense. But, when you are facing rejection after rejection it becomes an emotional response to give up. What statistical group do you fall-in? If it’s a lower one don’t feel bad. You can make it a point to develop stronger follow-up skills now. If you’re in the higher group, congratulations! You’re one of the 10% of salespeople that generate 80% of sales. It takes a disciplined person to follow up while continually hearing no. You see the end game and know the process is long. It’s very clear, in most cases, the longer we continue to have meaningful follow-up with a prospect the greater opportunity to win a client. (The client sees that you care and that you’re not going anywhere). It can be daunting but in the end the result is worth celebrating. If it were easy everyone would do it, right? But it’s not. It is well documented that it takes between 11-14 touches before someone buys. And, I can vouch for that in my business too. Some might say that sounds high. But to me, it sounds right on point because you’re including multiple layers of touches including e-mail, social media, phone, and/or face to face meetings. It’s hard to make that many connections and to not be a pest. There will be definite times when the client might not appreciate the bugging. It’s hard to do but we need to back off. (Or at least I do). But, I’m willing to admit that my follow-up needs more balance; and, I plan to work on it. What about you? Older PostAre customers mouthing-off about your brand?